Trying to figure out poker terms? We know just how frustrating that can really be. You think you know a few things and then you wake up to find that you still have quite a bit more of the elephant to eat. The best thing that you can do for yourself is to just keep moving slowly in the direction that you ultimately wish to go. That’s going to be the key to long term success in poker. We get asked about expected value so much that we might as well talk about it here. In a nutshell, expected value refers to the average outcome of a given scenario over the long term. Note that last phrase: long term. This is not fort short term players. Expected value is all about figuring out the right decision to make over the long run, which is very important when you’re trying to improve your poker game. You have to be able to look at every possible outcome, multiply each by the chance of that outcome taking place, and then adding those numbers together. You can use a simple six sided dice to look at expected value. If I roll a 1, that has a 1/6 chance of happening. Same with 2 – 6 — all 1/6. You then need to add the probabilities together. If you don’t have a calculator handy, don’t worry — we have you covered there too. The expected value (answer) would be 3.5. But you might sit and wonder what this has to really do with your poker game. Don’t worry, we’re definitely getting there. 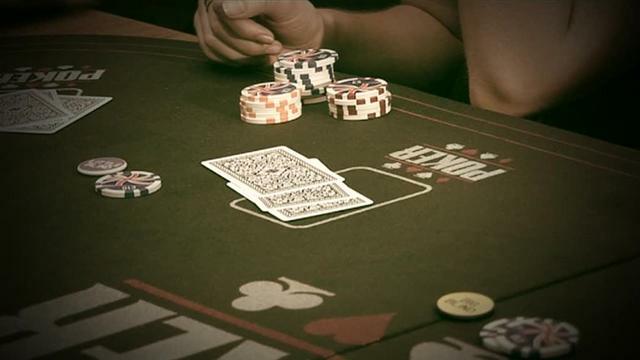 Expected value is where the “math” side of poker comes in. If you’re trying to limp with medium pairs, you need to see if it’s going to be worth it. Let’s assume that the pot in question isn’t raised and there are other people that are going to jump in as well. That’s going to be a play that has a good chance of positive expected value. The poker world can be divided into positive and negative expected value. You want to go with the highest expected value possible for your situation. Oh, AJ. Such a marginal hand in many ways, but many poker players love you. That’s gotta count for something, right? Well, everybody has to have a dream…we digress. Your opponent has some different options. They can hold any two cards, but they will fold if they don’t have a club. If they do have a club of some value, they will bet, but if they have a good club (Kc / Qc), they’ll make two bets. If you check, they will bet, and check with no clubs as well. The math comes into play as follows: given the fact that the opponent can hold any two cards, each of the individual clubs is just as likely to be in his hand. We’re also assuming that he can’t have two of them, otherwise he would have raised on the turn if he had. Note: this assumption will usually not hold up on the actual table, we’re just talking theory here. If opponent calls, you know that it will be with an inferior hand — otherwise he would have bet the crap out of you. There are 6 possible clubs that he could call with. So six times you will win an extra 10$. Since there’s 8 clubs available, the chance of him calling is six out of eight, or 6/8. However, if he raises, this means that you have a worse hand than he does. This means that you will have lost $10. So your expected value would be the sum of these two outcomes, 7.5 + -2.5 = $5. This is positive expected value, so it’s all to the good here. But what about Scenario Two? 6 times out of 8, you will win when you call the bet, and 2 times you will lose. Same outcome – overall expected value will be $5. So in this setup, checking really is as good as betting. What about checking with the intention of raising a bet made by your opponent? That happens more often than we expect. In order to make this scenario plausible, we have to assume that the opponent will re-raise with the nuts. So if he has the King of clubs, he has the best flush possible and you will need to fold. We’re still going to also assume he is going to call the raise with any other club. If he has the King, you have to fold and lose $20. If he has the queen, you get to the showdown, but you still lose the $20. 20 * 6/8 = $15! The big conclusion to this expected value calculation is that your EV is going to be 6 bucks higher if you check and raise instead of just betting out. This means that you now have the power to maximize your winnings. You should check and raise if the opponent bets, since that’s giving you a profit that’s roughly half a big bet higher. Since poker players play with small edges, that extra 0.5BB can be seen in the long term win/lose numbers. Squeezing out any type of value is often the name of the game here. When we’re not talking about professionals, this is honestly the way it goes. You have to make sure that you’re thinking about the little things. When you go back to analyze your hands, expected value is something that you’ll need to be looking at. This ties in well with pot odds and implied odds as well, if you’re looking for the next thing that you oughta research. We know this guide is pretty long, but we hope that you enjoyed it anyway. Confused about something? Let us know in the comments. Good luck and keep practicing!